15-Aug-2011 by THF in Hoot's Corner | Comments Off on Steroid abuse is exploding! Steroid abuse is exploding in Australia. Â Based on what we know, this is but a reflection of what’s going on internationally with these drugs. STEROID abuse by everyday gym users is skyrocketing with thousands of people caught trying to import the drugs each year. The amount of steroids being smuggled into the country at airports and through the postal system has more than doubled in the past five years, according to Customs figures, reportedÂ The Daily Telegraph. Customs made 2695 seizures of steroids and growth hormones in the year to July 2010, a 155 per cent increase on the 1054 seizures made in 2004-05. An explosion of websites selling the drugs with claims of “discrete (sic) shipping” and “no customs” is behind the rise as amateur body builders seek to exploit countries with lax drug regulations. “The majority of performance-enhancing drugs are detected at the international mail gateways and are generally from internet sites located in overseas jurisdictions which do not exercise the same controls as Australia,” a Customs spokesperson said. Most of the drugs seized are being imported from the US, Thailand, Hong Kong, Bulgaria, China and the UK, Customs said. The revelation comes after the death of 22-year-old Australian bodybuilder and online celebrity Aziz “Zyzz” Sergeyevich Shavershian, who died of an undiagnosed heart defect in a Thai sauna last week. His brother Said, 25, was found in possession of an anabolic steroid during a police raid last month. The Fitness First personal trainer pleaded guilty and was fined $479. 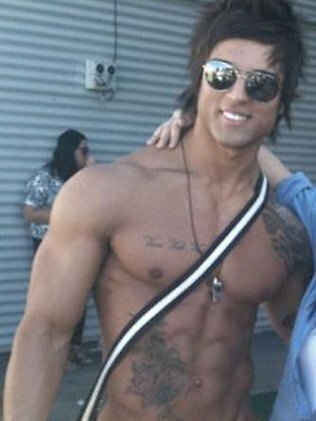 Zyzz denied using steroids despite talking about riding “bicycles” – gym slang for using a cycle of steroids – on Facebook. St Vincent’s Hospital hormone expert Katherine Samaras said a dangerous culture had formed in the past decade in which more and more young men felt the need to have the perfect body. “Many men don’t have that body and feel quite pressured to use anabolic steroids to achieve that look which is just not possible without them,” Ms Samaras said. Men are doing irreversible damage to their bodies by using steroids, with some even injecting veterinary steroids and fertility drugs to increase their testosterone levels, she said. “A lot of men are also using saunas and diuretics to lose weight ,” she said. “This can lead to blood mineral disorders which can lead to fatal heart arrhythmia.”She said websites promoting steroid use were preying on the insecurities of young men.